This piece was the last one I painted just before taking a solid month off of work. YES A MONTH! I now realize how long that was, and the thought scares me a little, but I'm so thankful for that time I gave myself. I spent the bulk of it with family and friends, traveling to the Philippines, Singapore and Texas. 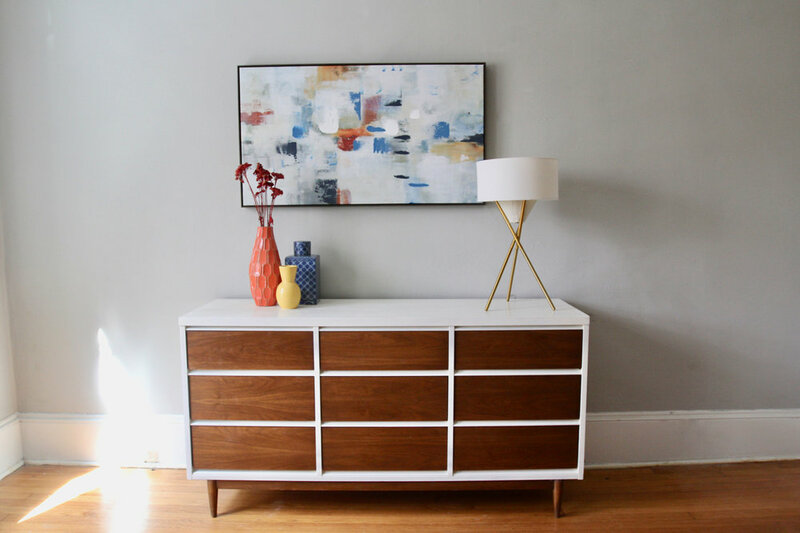 Getting myself back to the reality of work and day to day life has been a struggle, but I've had that painting itch for some time now, and the photos of this beautiful, classic mid century dresser reminded me how clean and simple furniture and styling brings ease to my mind and inspires me to create more. When I'm stuck in a rut, whatever kind it may be: writing rut, cooking rut, socializing with humans rut [that's can be a thing from time to time for me! ], all I need to do is remind myself to keep it simple and take small steps towards getting back into the swing of things. Maybe it's just filling out a Q&A about life quiz to rejig my brain, maybe it's just putting together one of my favorite breakfasts like avocado toast with scrambled eggs and a new addition of chipotle chili sauce...mmm [that was this morning!]. Or maybe it's just spending some one on one time with a friend on the porch, drinking wine or a cup of coffee and watching the world pass us by. It's incredible how little moments like this can reinvigorate me, revitalize me and remind me about my love for all the passions in my life. Painting is the one passion that most clearly connects my personal interests with my professional ones. Yesterday to get myself out of my painting rut [though I suppose it was less of a rut and more of a vacation, but no matter!] I decided to repaint a pair of side tables I was given. I'd already painted this pair, but decided they needed a new color to better suit their home in my Airbnb. Once those are photographed and ready to go, I'll share them here, but for now, I wanted to gush about this mid century beauty. Mid Century is the one place where I don't tend to overcomplicate things. I find their form and structure so beautiful in their original state that I hate to fuddle with it too much. Sometimes I'll get creative with my color choices, but this time I took mid century to its purest form. I stuck with a few coats of Annie Sloan's Old White on the frame of this piece. I love using white with modern pieces because it creates the perfect blank slate for whatever design choices I'd like to make. I'm a person who changes the style of my home depending on how I'm feeling that week [or sometimes that day! ], and I find using small objects and wall art to inject color is my favorite method of design. Keeping this piece so simple is what makes it feel timeless. I could style this piece in so many ways, my brain perks up just thinking about it! For this shoot, I was so frazzled about leaving for the Philippines, I kept the styling basic and modern. I love taking a piece of art and pulling a few colors from it to incorporate into the design vignette. For me, it's the easiest way to create a really pulled together style. This series reminds me how important it is to edit, and keep things minimal sometimes. It brings an ease to my mind that I can't get enough of. This simple series of photos is inspiring me to get out there, find some new pieces to work on and pick up the paint brush. Check out this piece and others I've got for sale in my shop!